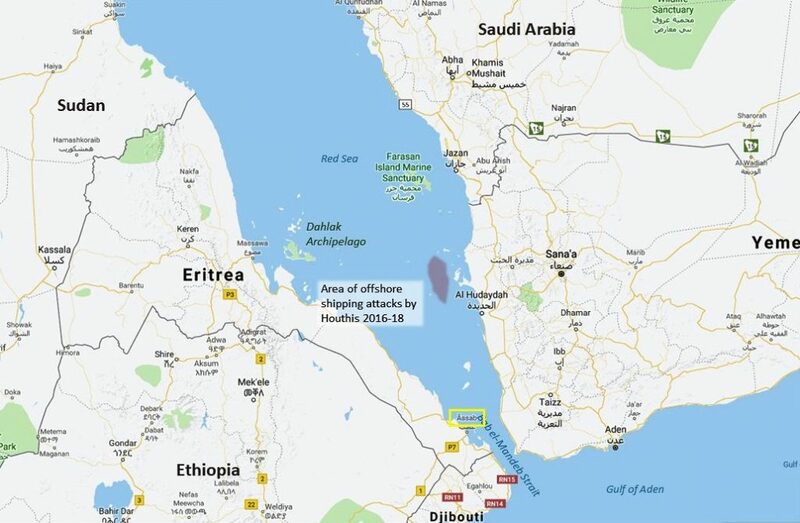 Houthi rebels in Yemen attacked at least one Saudi oil tanker last week, on 25 July, inflicting damage on it near the stern and prompting the Saudis to suspend oil transport through the Bab el-Mandeb Strait and the Red Sea. Analysis of publicized threats from the Houthis and Iran just prior to and after the shipping attack strongly indicated high-level coordination of the attack on the Saudi oil trade. A mysterious incident at the international airport in Abu Dhabi, UAE on 26 July – claimed by the Houthis – may have been implicated as well (although there is less evidence for that. My write-up on the two incidents is here). In the days since the shipping attack, some analysts have suggested that an Iranian cargo ship, Saviz, was involved in the attack, acting as a target spotter for the Houthi (or Hezbollah or Iranian) shooters ashore. The most widely cited report is that of DEBKAfile, an outfit of which I am extremely leery. 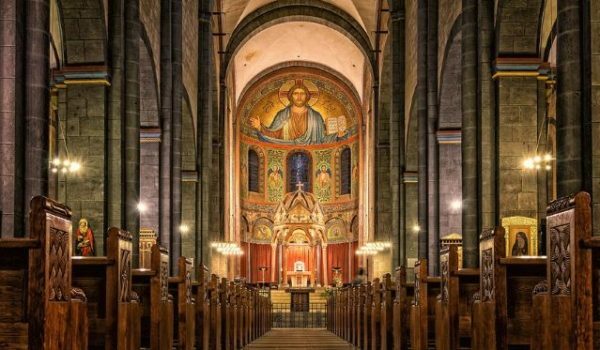 DEBKAfile tends to traffic in sensational and undisprovable claims – and claims, moreover, that never seem to amount to anything. But there is no doubt that Saviz is in the Red Sea, and has been maintaining a most peculiar profile there for many months now. The mainstream, respected Washington Institute suggested after the 25 July attack that Saviz’s role in Houthi attacks on shipping is in urgent need of investigation. And there are good reasons for that. There may not be credible proof of everything Saviz has been doing, but it is certainly possible the ship has been playing a tactical role. It’s especially likely that Saviz has been running arms to the Houthis. 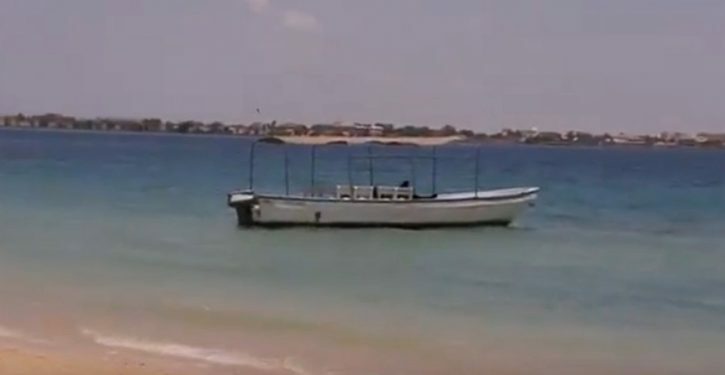 The same boats with which the arms are run could be deployed as a local reconnaissance network for anti-shipping attacks. 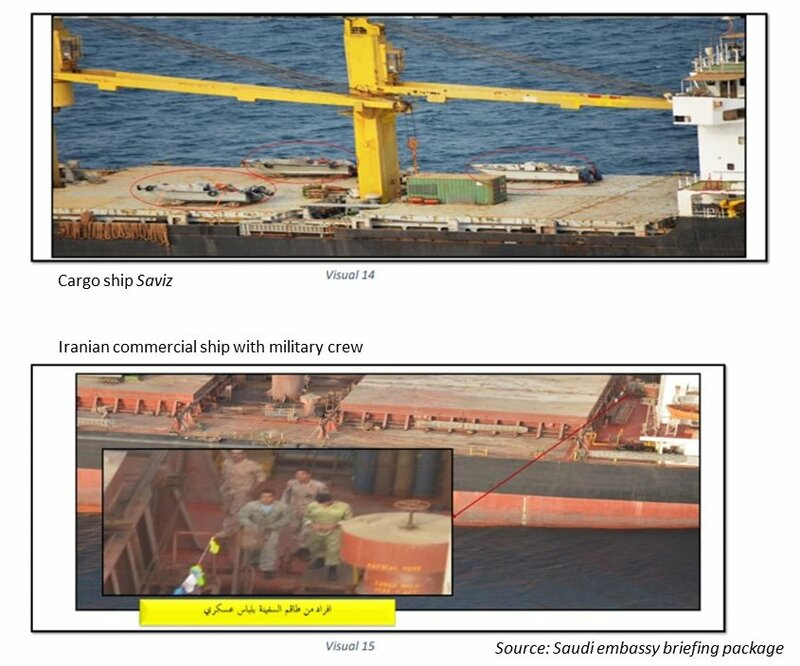 In November 2017, the Saudis provided documentation of suspicious activity by Saviz, including a photo of Saviz with three fast boats like the ones used by the Houthis, on her cargo deck forward of the ship’s bridge. The same document shows another, unnamed Iranian commercial ship with crewmembers who appear to be military. After the Saudi document came out, Jane’s Defence Weekly editor Jeremy Binnie tweeted a screen cap of a ship-tracking map showing a position for Saviz on the Dahlak Bank, just east of the Eritrean Dahlak Archipelago, noting that the ship had been in a “holding pattern” there for weeks. Saviz appears to have remained there for extended periods in the months since. This is not the typical profile of a large, modern, ocean-going cargo ship, which would be expensively ill-employed lingering among islands in the southern Red Sea. Unless, of course, its activities were being performed for the Iranian national government. All Iranian commercial ships could be on such missions at any time, and Saviz has been in the past, operating as part of Iran’s arms proliferation network. 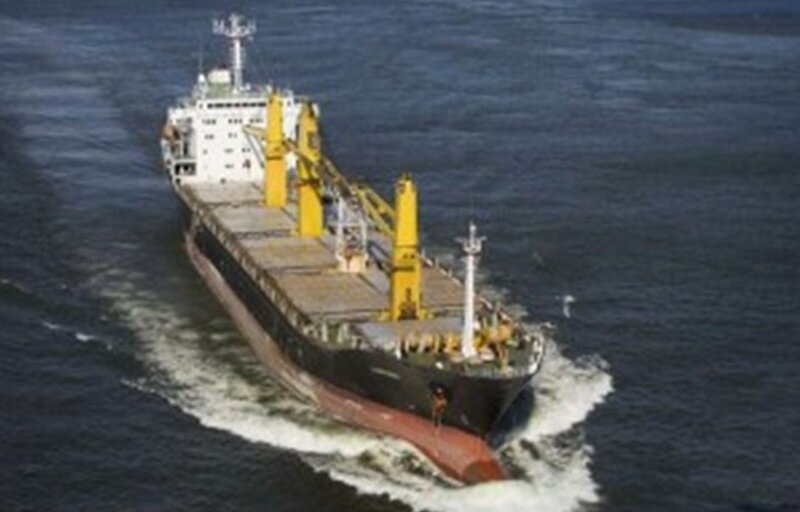 The ship, built in 1999, operated early on as the Iran Lorestan, but fell under U.S. and UN sanctions in 2007-08 as the asset of known arms trafficking entities in Iran, including the shipping company, Rahbaran Omid Darya Ship Management, and the owner, Oghiaanous Khoroushan Shipping. Both are known affiliates of the Islamic Republic of Iran Shipping Line (IRISL), the national line used frequently in the 2000s and before to transport arms. In the period 2009-2012, the ship – IMO number 9167253 – followed the pattern of most IRISL assets and changed names, ownership, and flags multiple times. Iran Lorestan became Ocean Candle, Lantana, and then Azalea, before finally assuming the name Saviz in 2012. The purpose was to evade sanctions, and like other ships, Saviz went through a series of convenience flags and shell companies as well (including a parent company, Loweswater Limited, briefly managed from the Isle of Man). But the sanctions against the Iranian entities involved in arms proliferation – including Saviz’s manager and owner – were lifted when the Joint Comprehensive Plan of Action (JCPOA), or the “Iran deal,” was implemented on 16 January 2016. 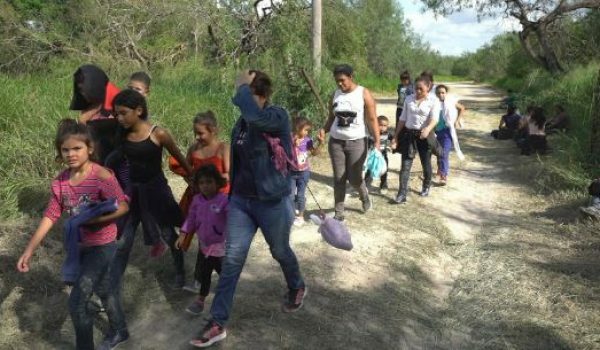 The lifting of sanctions included waivers from the Obama administration. From that point forward, Saviz was able to ply the world’s oceans without putting anyone who did business with her or her owners at risk of falling under sanctions too. For months, we have seen what Iran used that freedom for with Saviz: to keep her lurking in the Red Sea, 60 miles from the islands off the coast of Yemen’s Hodeidah Province, where the Houthi rebels operate. There is a lot to track down in the days ahead, regarding what Saviz’s (or other Iranian ships’) operating profile may be. As discussed a few weeks ago with the geographic and maritime realities of the Persian Gulf, the southern Red Sea is basically a lot of land with a little water in between. 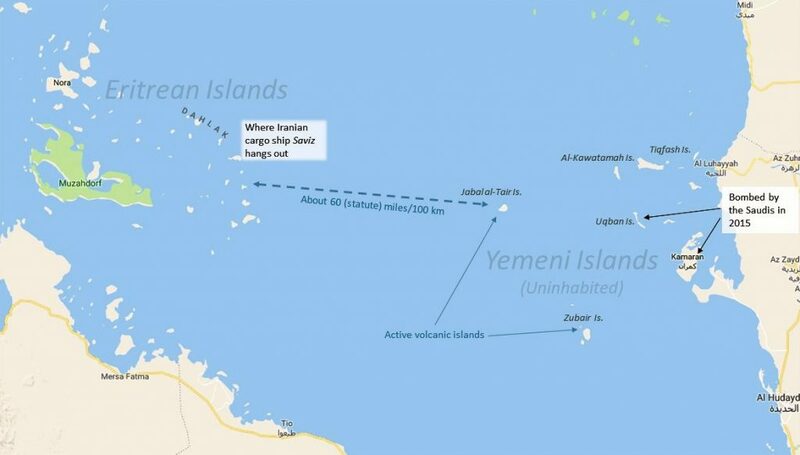 Earlier events have given strong hints about what the Houthis and their backers are doing with the local conditions: for example, in October 2015, the Saudis reportedly mounted a major attack on the Kamaran Islands offshore from the port of Hodeidah. This was presumably to take out infrastructure (however primitive) installed on the islands. There were numerous reports prior to the rapprochement of Eritrea and Saudi Arabia in 2015 that arms were being smuggled to the Houthis from Eritrea – arms that were being delivered to Eritrea by Iran. The smuggling method was at least partly by fast boat, a longstanding practice for multiple purposes across the narrow gap in the southern Red Sea. The Dahlak Islands of Eritrea include inhabited locations, and host a resort and diving companies. But the Yemeni islands on the other side are uninhabited – which makes them ideal for moving contraband. Moreover, the closest islands to the Dahlak Archipelago, Jabal al-Tair and the Zubair group to the south, are active volcanos, which have seen an eruption as recently as 2013. That doesn’t mean the islands are necessarily unusable. It means gun-runners would have those islands to themselves; even fishermen don’t find it worth their while to operate there. Since 2015, when the Saudis sealed improved relations with Eritrea and attacked Houthi infrastructure in the Kamaran Islands off Hodeidah, a couple of conditions have shifted. The UAE has committed significant military assets to the Saudi coalition operating in Yemen, and has basically established a forward base in Assab, Eritrea (where Iran previously was developing a logistic facility, and was reported to have briefly sent a submarine as early as December 2008). This base is paired with the UAE’s use of Yemen’s Socotra Island in the Gulf of Aden to put Emirati logistic heads on either side of the Bab el-Mandeb Strait. That clamps down somewhat on Iran’s freedom of action, and certainly on her former posture of emerging ascendancy as the major outside partner of key Red Sea nations: Sudan and Eritrea. Since 2014, Iran has lost her dedicated patron-client relationship with both of those countries. The cargo ship Saviz can thus do weird stuff largely uninhibited in the Red Sea, as can other Iranian commercial ships. 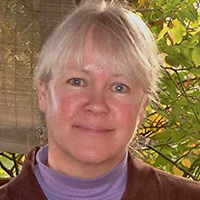 Social media reporting suggests that Saviz spends her time running back and forth on a very short tether to an anchorage off the Dahlak Archipelago. 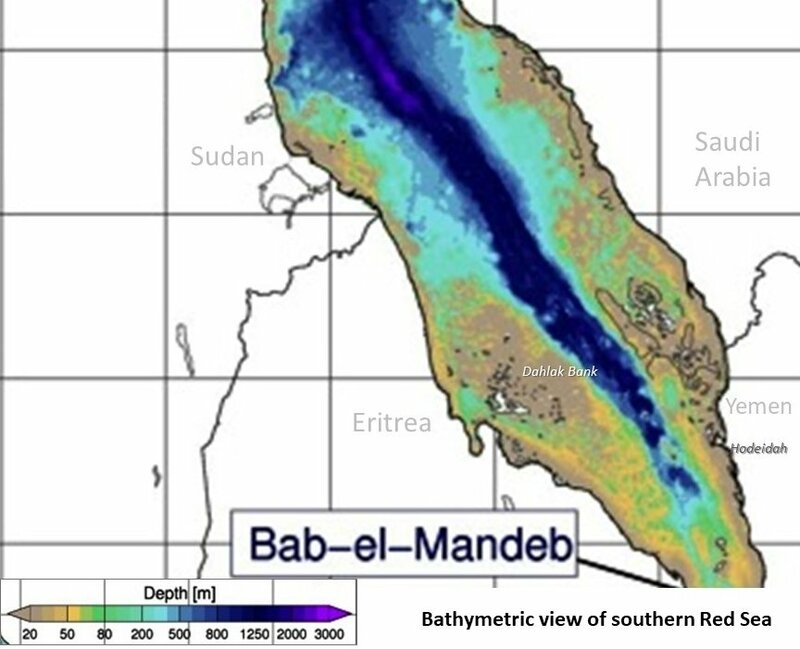 As the bathymetric chart indicates, there is plenty of 10 fathom or shallower acreage on the Dahlak Bank. Iran could get a lot done with cargo ships ducking in and out of coves in the Dahlak Islands, and a small fleet of fast boats. There’s more than one way to move cargo to Yemen; even to move high-end contraband. Sloppy, run-down inter-island ferries, fishing boats, dhows – the moving platforms don’t have to stand out against the seascape. A ship like Saviz could carry Qods Force command and control elements and host berthing and logistics, while controlling the activities of smaller, lower-profile craft. The maritime problem in a chokepoint is short-legged but very multifaceted. It’s time to get the sanctions game face back on, and pay Saviz or her sister ships a visit with a U.S. cruiser or destroyer.